The Scripture above says that the person that sins shall die for their own sins, not the sins of the father. We do not die spiritually for the Original Sin of Adam. I encourage you to read all of Ezekiel 18 to see that I am not prooftexting here, i.e. taking it out of context. Nowhere in Scripture is it taught that we die for our father’s sins. The penalty of your sins falls on you, not your children. The sins of your father fall on him, not on you. 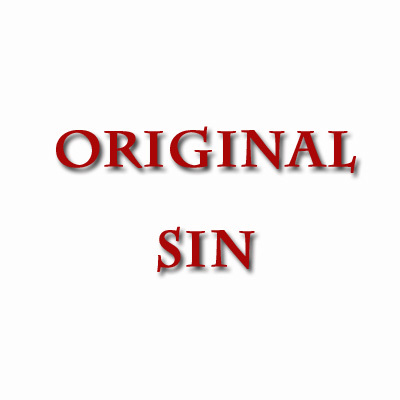 This is a principle found throughout Scripture therefore the case of Original Sin would not fall under different rules. Eze 18:2 What mean ye, that ye use this proverb concerning the land of Israel, saying, The fathers have eaten sour grapes, and the children’s teeth are set on edge? As I live, saith the Lord GOD, ye shall not have occasion any more to use this proverb in Israel . Behold, all souls are mine; as the soul of the father, so also the soul of the son is mine : the soul that sinneth, it shall die . Jer 31:29, 30 In those days they shall say no more, The fathers have eaten a sour grape, and the children’s teeth are set on edge. But every one shall die for his own iniquity: every man that eateth the sour grape, his teeth shall be set on edge. First, if it were interpreted to mean God convicts or punishes the children for the father’s sins, then only the third and fourth generations would be guilty of Adam’s sin. However, the interpretation that the children are convicted or punished for the father’s sins is not correct. Why? Because it would completely contradict the Scriptures I just gave in Ezekiel 18 and we know God made no mistakes in the Bible. So, in the light of what God said in Ezekiel 18 we must conclude that it cannot possibly mean that the son is convicted or punished for the father’s sin. Notice the difference in the texts. Ezekiel 18 says, “bear the iniquity” but Exodus 20 says, “visit the iniquity.” Simply put, these Scriptures mean the children will not be penalized before God in judgment for the father’s sins; however, the children will have to endure the consequences of the father’s sins to the third and fourth generation. For example, the father may be a drunk. The children are not going to be sentenced to hell for the father being a drunk but the children will have to live in that household and endure the pains of such a lifestyle. God is saying that He allows the sins of the father to affect other generations so that we can see the seriousness of sin. Exodus 20 (and the other Scriptures like it) is specifically speaking about the covenant that God made with the Israelites. If they turn from Him and worship idols, they and their children would be thrown into captivity. That is not to say it is the children’s fault that the father worshipped idols nor is it a punishment for the children, but they still have to endure the consequences of the father’s decision to sin because they live in a household with a disobedient father. Visiting the iniquity of the fathers upon the children – This necessarily implies – if the children walk in the steps of their fathers; for no man can be condemned by Divine justice for a crime of which he was never guilty; see Ezekiel 18. Idolatry is however particularly intended, and visiting sins of this kind refers principally to national judgments. By withdrawing the Divine protection the idolatrous Israelites were delivered up into the hands of their enemies, from whom the gods in whom they had trusted could not deliver them. This God did to the third and fourth generations, i.e., successively; as may be seen in every part of the Jewish history, and particularly in the book of Judges (1. Clarke). We are guilty before God for only our sins, not Adam’s. Think about it, to say you are a sinner because of Adam’s sin takes the blame off of you. You are not guilty because Adam did it. You were helpless and had no choice in the matter so common sense would tell you that God could not blame you. However, religion mysteriously concludes that God does blame us for Adam’s sin without sufficient explanation or Scriptural proof. Death passes upon all men because they all sinned! The point Paul is making is that Adam opened the door to allow sin into the world. We now have a choice to make when confronted with temptation whereas before Adam’s sin we did not. Paul is not claiming that Adam’s sin makes the entire human race condemned immediately and directly. Paul is saying that Adam opened the door to allow the human race to be condemned when they sin. Reading this in context, it would be impossible to arrive at the conclusion, “I’m first a sinner because of Adam’s sin which is the reason I sin,” as opposed to what it actually teaches, which is that Adam opened the door to the choice of sin in the world, then I sinned. Therefore, I became a sinner and died because of my sin. This is not to be interpreted that Adam’s sin immediately and directly doomed the entire human race spiritually. “The offense” of Adam opened the door for sin which allows us to now sin, thus many become dead by their own sins, keeping in mind verse 12. This means Adam opened the door for the entire human race to potentially sin and be condemned, not that Adam immediately and directly condemned the entire race spiritually. To read the first part of this verse and interpret that Adam caused all men to immediately and directly become condemned, then we must use the same logic for the last part of the verse and concluded that Jesus immediately and directly caused us all to become saved. Calvinist, if they remain true to their way of interpreting the Bible, must also be Universalists. Of course, they are not Universalists nor should we read this to mean all of humanity is condemned because of Adam any more than all of humanity is saved because of Jesus. We are only saved if we make the choice to accept Jesus and we are only condemned if we make the choice to sin. Remember, Calvinism rejects anything that shows we have a choice. So they read the Bible from a wrong standpoint. (AMP) [ one man’s false step and falling away led] to condemnation for all men, so one Man’s act of righteousness [ leads] to acquittal and right standing with God and life for all men. (MRC) Therefore as through one transgression led to condemnation for all men, even so through one righteous act there resulted justification of life to all men. “Led to” means it resulted in the condemnation. This implies it was not directly because of Adam’s sin that we are condemned but Adam started the domino effect which led to us sinning, thus becoming condemned. The words “led to” seem to match up more properly with the context of verse 12. Again, this is not to mean that Adam directly made people sinners any more than Jesus directly made people righteous. No, in both cases man has to choose; he chooses to sin to become a sinner and chooses salvation to be made righteous. To say Adam’s sin was immediately and directly imputed but Jesus’ righteousness was not would be using bad Bible hermeneutics. I do not disagree that through Adam many are dead because it is absolutely true, indirectly. If Adam did not sin, then we could not become sinners in the flesh as a human race. Many read this to mean Adam sinned therefore I become a sinner immediately and directly spiritually, but that is not what it is saying according to Rom 5:12. Indirectly, because of Adam’s sin, sin entered into the world so now I can choose sin and I did. Therefore, because of my sin I became a sinner spiritually, not because of Adam’s sin. What was different between Adam’s sin and the sins of men after Adam to Moses? The difference is that Adam had one law to obey with no conscience. However, all men after Adam had to obey all the Laws in their conscience. In disobeying their conscience spiritual death reigned. Some mistakenly conclude we are condemned to spiritual death because of a sin nature in our flesh. However, if we are condemned to spiritual death only because the sin nature resides in our flesh, then Jesus was condemned as well because He was born from sinful Mary (Job 14:4) and could not be a sacrifice for us. You are not condemned to spiritual death because of a sin nature in your flesh. You are condemned to spiritual death only when you sin. If we are condemned to spiritual death because the sin nature resides in our spirit when we are conceived, then it is the same argument as above impugning the character of God. The spirit man must be born again once he knowingly sins. Why? Our spirits are withered from a lack of God’s presence. We are sickly and weak in our spirits because we are spiritually dead or separated from the presence of God. According to this verse, if God came back into our spirits without making us a new creation in our spirits first, it would destroy us. Every man that has died spiritually must be born again. Being born again means being born of God. It says in 1 Corinthians 5:17 we are a new creation when we are born again. God takes our spirit and creates it anew without sin, without death, and without depravity. We are clean, pure, and righteous in our spirit man because of our faith in Jesus Christ at the moment of conversion. Mat 1:18, 20 Now the birth of Jesus Christ was on this wise: When as his mother Mary was espoused to Joseph, before they came together , she was found with child of the Holy Ghost; But while he thought on these things, behold, the angel of the Lord appeared unto him in a dream, saying, Joseph, thou son of David, fear not to take unto thee Mary thy wife; for that which is conceived in her is of the Holy Ghost . Gen 3:15 And I will put enmity between thee and the woman, and between thy seed and her seed ; it shall bruise thy head, and thou shalt bruise his heel. 1Pe 2:22 Who did no sin, neither was guile found in his mouth: (notice the emphasis on His personal actions not the actions of another like Adam). He was never condemned like all of humanity was (Isa 53:6; 2 Cor 5:14). Jesus’ flesh ultimately came from Adam (remember He called Himself “The Son of Man”), thus He had the same flesh we do which has sinful desires. Even if He had special flesh at conception that was not corrupt, he had to eat of the food that comes from the fruit of cursed earth. That food is assimilated into His flesh so that His flesh is made of the same dirt every other man was made of. I do not believe Jesus had special flesh. Jesus was a man with the same flesh you and I have, yet He never sinned or became a sinner in His soul or spirit. If Jesus was born with special flesh without a propensity to sin, then the verse Heb 4:15 (“For we have not a high priest which cannot be touched with the feeling of our infirmities; but was in all points tempted like as we are, yet without sin.“) is a lie. Not to mention, for Him to not be able sin means His redemption has no merit because He could not really be tempted. If Jesus could not really be tempted, then He was not a man at all. Only a man can take the place of men on that cross to die for their sins. Heb 2:10, 18 For it became him, for whom are all things, and by whom are all things, in bringing many sons unto glory, to make the captain of their salvation perfect through sufferings “For in that he himself hath suffered being tempted, he is able to succor them that are tempted. Heb 4:15 KJVR For we have not a high priest which cannot be touched with the feeling of our infirmities; but was in all points tempted like as we are , yet without sin. Our spirits were in Adam when he did the original sin. However, you will not find one Scripture that says or even implies any of these possibilities. We have been taught wrong. Many have been religiously brainwashed and now it is time to read the Bible for ourselves and get a revelation of the Truth. The problem with this thinking is that Calvinism is so pessimistic about man’s constitution that everything we do is morally evil. But societies are good or else all the world’s societies would live under constant chaotic anarchist governments. However, we see governments making laws after God’s Law and upholding them. Man is originally good at his core, but sin has corrupted the flesh, the soul, the environment, our invisible enemy Satan, and his minions. With so much against us, it is no wonder that all have sinned and come short of God’s glory. Joh 3:7 KJVR Marvel not that I said unto thee, Ye must be born again. Why must we be born again? Because of the effects of sin in our spirits. We are permanently marred by sin. Considering the whole of Scriptures, we can be assured man is born righteous in his soul and spirit and sinful in his flesh. Man becomes sinful in his soul or heart. When he chooses to sin, after he has reached the age where he knows right from wrong, he dies spiritually. However, the good news is that Jesus is the Savior of the world. He has provided complete redemption from all sin and we are born-again when we put our faith in Him. Thank God for His immeasurable love shown through the LORD Jesus Christ! Glory to God! Clarke, Adam. Adam Clarke’s Commentary on the Bible. e-sword.net.